This is by one of my 5th grade students of Mundo Lindo, the grant-funded art program I created and teach. Way cute! Lesson two, in the joggles class I'm teaching, is paper on cloth, so I'm working out a design. I drew this from a composite of photos, and you know, it's just never as good as when I draw from real life! 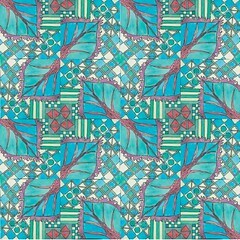 Lesson 2 & 3 in my joggles class will be creating your own tree of life quilt. A page from my tiny Moleskine sketchbook to work out some possible motifs. 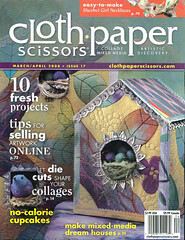 Have I mentioned that Cloth Paper Scissors and Quilting Arts are my very fave magazines. And not just because they publish my artwork and articles! In this latest issue, March/April 08 I've got an article on pages 82-85. Check it out. Both magazines are now owned by Interweave Press, but creator Pokey Bolton is still at the helm. (Her middle name really is Pocahontas.) Anyway, I'm going to be in one of their upcoming books. Mixed-media Self-portraits will be out in September 2008 and I created a special self-portrait for it and wrote an article. Cool! Last week, I had the Mundo Lindo kids made birds from baker's clay, and this week they will paint the sculptures and then do a painting of it, in aboriginal dot painting style. As the caption says, isn't it amazing how tulips continue to grow after you cut them and put them in a vase? These tulips and roses were all the same height when I put them in the vase just a few days ago......It's raining outside, so this bunch of flowers is a glorious spot of color in our house! I’ll be teaching another online Joggles.com class starting next week! And this quilt is for the first lesson--just finished it yesterday! “The Small Art Quilt” is a brand new class, with new projects and is 6 weeks long and begins next week February 28. 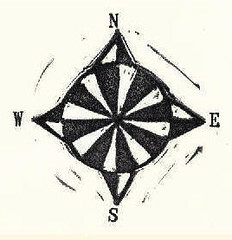 Here's that artwork I needed the compass stamp for. It's for the Escondido Children's Museum annual fundraiser, Moonlight Masquerade. This year's theme is "Setting Sail." 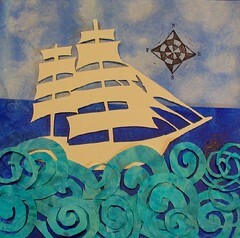 I painted the papers, cut them out, and collaged it--sort of an Eric Carle style. Description: What’s mixed media? Everything and anything! 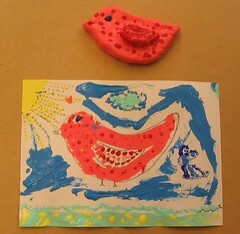 We’ll paint, collage, draw, print with our own hand-carved stamps; sew and glue, even burn—all to make art. This class encourages your own creativity with lots of techniques and ideas. Most everything in the class can be done on a paper surface or a cloth surface or a combination of the two. 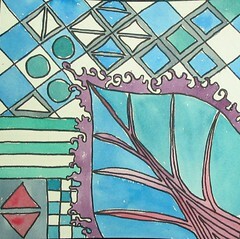 Emphasis will be on finding a theme or motif to develop into a series. Each week we’ll explore a new technique to help you express that theme. Class will be inspirational, positive and fun, with lots of sharing, laughing and learning from the others in the class. All levels of experience welcome. Materials List: $15 materials fee will be collected in class. For the first day, students, please bring the following: two sheets of 140 lb watercolor paper (size is your choice); collage papers and/or cloth; gesso; liquid matt medium; a brush; sketchbook; pencil; permanent ink pen. A materials list will be given and discussed at the first class. As you saw from the previous post, I really like Raphael Lopez's work. 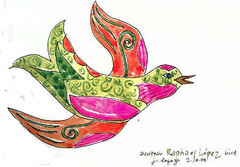 I drew some of his birds, then painted them in my own colors, with watercolors. Makes me appreciate his work even more! Raphael talked about finding his own distinct style and voice in his artwork. I wonder if that will ever happen with me? I just love trying to techniques and subject matter and styles! I even made some birds in baker's dough today! (Working on a lesson for the Mundo Lindo kids.) Now I'm going to paint them, Lopez style. 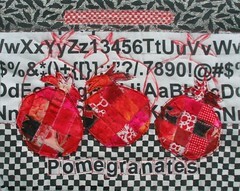 Hey, a reminder that my joggles class "The Small Art Quilt" is starting February 28, so check it out. It's a 6 week class. On Saturday, Husb and I went to see and hear Rafael Lopez talk about his artwork and do a painting demonstration. He lives here in San Diego, and is a very successful illustrator (he's done 3 postage stamps!) Great guy, wonderful artwork. He's done murals and illustrated a couple of children's books too. This wonderful (acrylic on board) illustration is from the book "Yum! MmMm Que Rico" and Husb and I bought it! I'm working on artwork for a fundraiser, and spending way too much time on it. 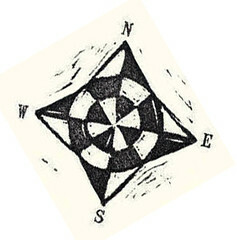 A small part of the art is a compass. Which of these works better? 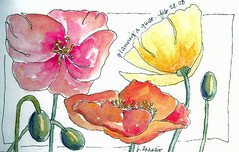 Channeling Charles Rennie Mackintosh's flower paintings. Notice the highly technical botanical terminology. I taught that lesson on Charles Rennie Mackintosh that I created a couple of days ago to a group of 4th graders today. I photographed their one image in class, and them when I got home, repeated the image to create these from the kids work. Cool. 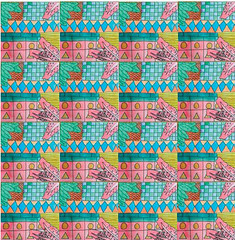 They worked in watercolor, but it would be fun to develop this so it can really be translated to fabric. 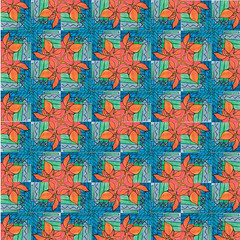 Another kid's work, repeated into a pattern. 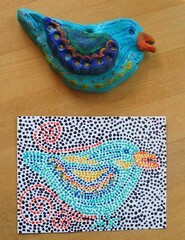 another 9 year old textile designer! 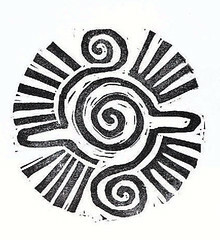 Hand carved stamp. I like this one, it's based on a Mexican prehispanic design that I saw in a museum on my first trip to San Miguel de Allende, in 2000. I've used the image a lot in my work. 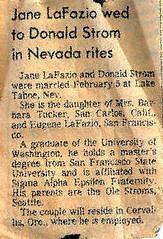 Thirty one years ago today! We wore blue jeans, and the ceremony took less that 10 minutes. But it worked! I'm working on a watercolor lesson on Charles Rennie Mackintosh for 3-6th graders. 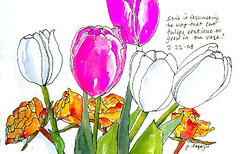 (He was a Scottish architect, in the late 1800s, but he also did gorgeous watercolor flower paintings.) 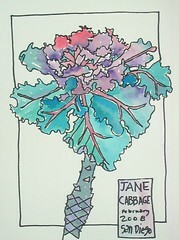 Here's step one, a watercolor from a real flower in Mackintosh's contour drawing style. 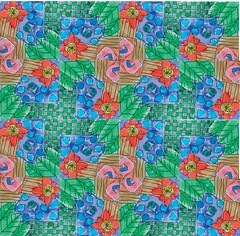 Step two, create a square design, based on the flower painting, using the same colors and similar shapes. Combine the organic shape of the flower and geometric shapes. As you know, I teach kids art through Mundo Lindo and at other local schools. I started teaching kids about 6 years ago, kind of by accident. This photo of my late father, dated Summer 1987 shows him with a group of kids in San Francisco. He loved working with kids and volunteered in the city for more than 25 years.....and he obviously passed that gene on to me.